They started by sweeping across America and Canada, and since being introduced in the UK last year Ittys Bittys have been a bit hit with kids and adults alike, filling homes, toys boxes and mantle pieces. But just what are Itty Bittys you may be asking, well read on. Itty Bittys were first created by Hallmark in 2015 and having being a huge success in America and Canada they came over to the UK in October 2016, causing a stir from the moment they hit the shelves and its clear to see why. The cute and loveable characters are just like their life size counterparts but in miniature cuddly form. There are no lights, voices, batteries or parts to worry about and no gimmicks or fiddly instructions just great quality collectables that are oh so cute! These mini cuddly companions stand at 5 inches tall and come in a whole range of recognisable characters. Itty Bittys come in a range of collections, the collections currently available here in the UK are - Star Wars, Marvel, Wizard of OZ, DC Comics, Scooby Doo and even Snoopy and Peanuts. 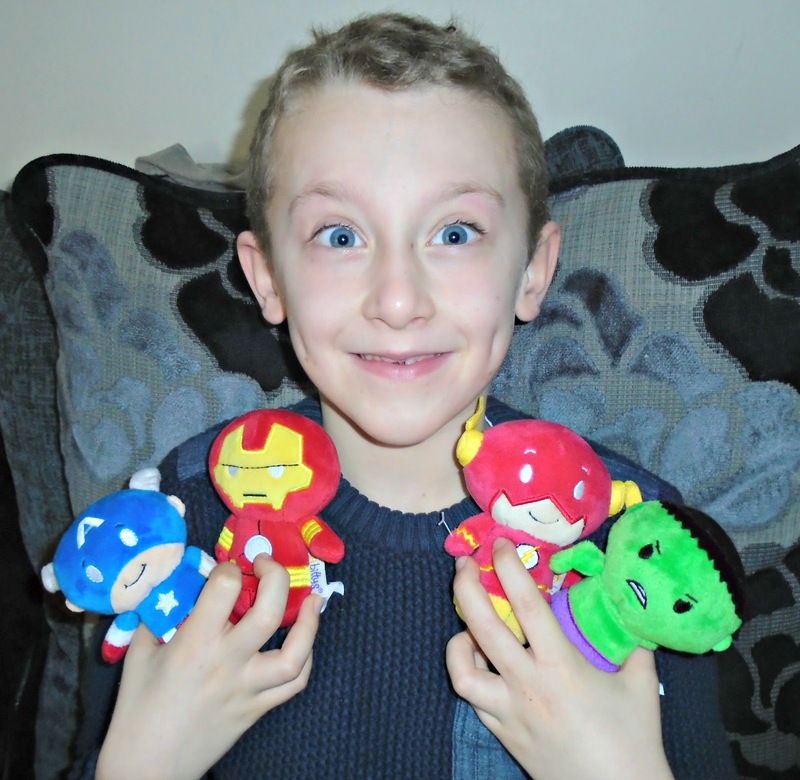 James chose The Hulk, Iron Man, The Flash and Captain America and I know these won't be the last of his collection as he is already talking about what other characters he would like. Ittys Bittys make great pocket money toys too, especially if your child likes collecting things. Priced at just £6 each they are, I think a reasonable price and something a child could quite easily save up pocket money for. If there was one thing I would like to have seen would be a little loop or hook on the back to maybe attach a keyring or clip. James would have loved to have attached one to his school book bag or backpack but as there is nothing to do this with he was unable to do so. This however doesn't effect his love for his new Itty Bittys and they take pride of place on his pillow. If you want to check out the full range of Itty Bittys you can check them out via the Itty Bittys website. Which character would you or your little one love to own? Awww these are cute! I love the little Hulk's face! They are so adorable, bet they are a real hit with kids!